Golf courses like the one at Rivershore Estates & Golf Links, which was designed by Robert Trent Jones Snr, are a rare breed in Canada. The old master architect was responsible for hundreds of layouts south o the border in the United States but his projects in the Great White North can be counted on the digits of one hand. 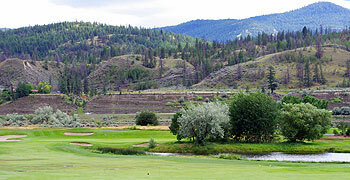 Occupying a section of the South Thompson River flood plain, half an hour’s drive out of Kamloops, the fairways at Rivershore are laid out in two returning nines. Holes 3 to 5 on the outward half weave through a small residential estate, with the closing two holes on the back nine situated close to the fast flowing waters of the river. Although the South Thompson River never really comes into play, a couple of sizeable lakes do have a bearing around the turn at holes 8, 10, 11 and 13. Even though the layout is pretty open is aspect, if you factor in around 100 of Trent Jones’s trademark bunkers then it’s easy to see why this course is regarded as a tough test of golf. The club has hosted a number of national amateur competitions, including the Canadian Men’s Senior Championship in 1992, Women’s Amateur Championship in 1997 and Men’s Amateur Championship in 1999. On the professional front, the Western Championship on the Canadian Tour was also held here more recently in 2011. Rivershore Golf Links is one of Robert Trent Jones Sr.’s last signature designs and has hosted many national golf events including the inaugural Canadian Tour’s Western Championship and the BC PGA Championship. Built in the late ‘70’s, this par 72 was definitely ahead of its time. Stretching out to over 7,000 yards with a rating of 73.2 and a slope of 135 this course definitely has some bite. Rivershore sits along the northern bank of the South Thompson River with sagebrush-covered hills as its backdrop. Even though the property is relatively flat, the combination of fast greens and 95 sharp cut, well defined bunkers will definitely test your skills. Holes two through six are surrounded by housing which I found somewhat distracting. My favourite holes are probably #10, a tight par four with water down the entire left side and in front of the green forcing you to cross it on your approach shot. Hole #16 is a downhill par four with a very difficult shallow green protected by a pond in front and the 18th is a long par five that plays all along the river. To read the complete article on Golf in Kamloops BC visit: http://golftravelandleisure.com/2013/08/21/golf-in-kamloops-bc/.